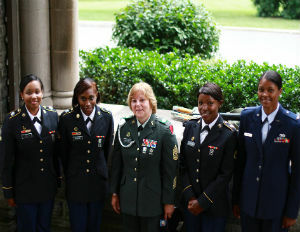 On June 27 and 28,Â Women Veterans ROCK!,Â a coalition of women Veteran organizations supporting women veterans & military families, will host “The Women Veterans Summer Leadership Retreat” at Chestnut Hill College in Philadelphia, Pennsylvania. The Summer Retreat will include more than 200 women veterans, U.S. Servicewomen, military spouses and girls in military families from Delaware, Maryland, New Jersey, New York, Pennsylvania, and Washington, D.C. Attendees will hear a keynote address from Jennifer Merschdorf, CEO of the Young Survival Coalition, and US Navy veteran Ventris C. Gibson, Associate Deputy Assistant Secretary for Human Resources for the Department of Health and Human Services (HHS). And female professionals and students are invited to join the organization and the women veterans community for a unique educational experience as they engage in public dialogue about pressing issues in civic leadership and advocacy while learning from female professionals who are redefining how women engage in these fields. “Today’s women veterans are the best advocates to serve as catalysts for positive change in the delivery of services to America’s military families,â€ saidÂ Deborah Harmon-Pugh, National Campaign Chair of Women Veterans ROCK! & Chair of The Women Veterans Civic Leadership Institute. Anyone interested in attending this two-day developmental retreat is encouraged to register in advance by visitingÂ www.WomenVetsRock.org.